Molluscum contagiosum is a fairly common viral infection of skin. The infection is frequently reported in children and young adults, especially in the first 10 years of their lives. Although anyone can develop this infection; yet children with compromised immune systems (such as patients of AIDS and SLE) are more vulnerable. Researches have shown that this virus manifests gender predisposition with a much higher number of male cases as compared to females. Statistically, tropical regions are at high risk of this infection. The overall prevalence within United States is 1% of all dermatological conditions reported in clinical setting. 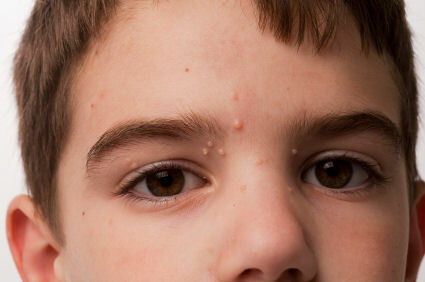 The causative agent of this infection is Molluscum Contagiosum virus or simply MCV. There are 4 identified strains of this virus, of which, type 1 is found most common in causing this infection and interestingly, this virus only affects humans. After primary exposure to this virus, the replication phase of this virus begins, which shortly leads to symptoms. Symptoms can start to appear between 2 weeks to 6 months of exposure, depending upon the strain and baseline immune condition of the affected body. For children have a relatively weak immune system, they are more vulnerable. The size varies between 2mm to 6 mm, and they are mostly filled with waxy depositions. It is important that parents should know that the lesions are not painful, but they are itchy in nature. If parents suspect their child have the virus, they should take their baby to a dermatologist. Viral conditions can be very tricky to treat, but with Molluscum Contagiosum home remedies are one of the easiest and very effective treating methods. However, it is necessary that the treatment being used be confirmed by the doctor. Using natural, antiseptic products such as tea tree oil, cider vinegar and elderberry extracts can help eliminate the virus gradually. They should be applies locally to the affected areas. In some cases, moms resort to bursting the lesions with the application of gentle pressure. This has proven effective for many individuals, but proper care needs to be taken with cleaning the areas and not letting the waxy liquid spread to other part of the skin. Moms who are willing to try this method should burst the lesions with clean, ideally sterile hands. In large lesions, it is generally recommended to use peroxide to clean the skin. After thorough washing with water, a local antiseptic such as Neosporin can be applied locally. Compared to months of treatment, this treatment can alleviate the lesions within a few weeks. Allopathic treatments mainly focus on the use of drugs that can treat the symptoms of the disease. Topical creams and lotions of the following drugs are available and have proven effective in treating the lesions. Molluscum Contagiosum virus results in the formation of clusters of lesions that are fleshy looking and embossed. Transmission is usually through skin-to-skin route. If you scratch the lesions and then touch the unaffected body parts with the same finger, lesions will start to appear on that part. Besides, sexual contact and touching contaminated clothing and bedding can also result in the spread of virus. For kids, the interactions in day care can greatly spread this virus around. Avoid using a razor in areas where lesions are present. Why Is Your 4 Year Old Complaining of Foot Pain? What Causes Fluctuating Fever in Toddler?